Our ladder archery program makes it easy for archers to challenge opponents and record their results. The archery ladder software updates rankings after an archer reports their win through the website. View other archery software products that R2 sports has to offer including: Association Rankings, tournament, membership, and league software. Archers are able to get all of the archery ladder information through the website. The website sports ladder home page, displays recent results and activity history to the participants. In order to register for the archery ladder, click the online registration link. After the registration has been completed for the archery ladder, archers are given an initial challenge ladder ranking position underneath the lowest ranked archer. Click the rules tab on the navigation bar to view the challenge ladder rules that the director has selected during the ladder setup. Archers can click on the reporting link and then login to view available challenges and choose an opponent to request a challenge. The person being challenged receives an email where they can view the times requested and accept the challenge request. After the archery competition takes place between the two participants, one of them can return to the reporting section to enter scores and report results. 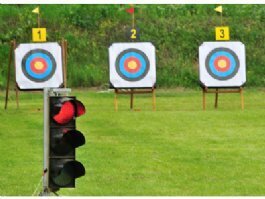 The archery ladder system sends emails to archers when different actions occur, such as: A challenge is requested or accepted, someone reports a challenge, and when a penalty is issued to an archer. Join an archery ladder today. The archery ladder director is in charge of going through the ladder challenge setup. Name the ladder, specific divisions to offer, and set all the archery challenge ladder rules. Rule options include: Number of ranking positions that can be challenged up, option for archers to have one open challenge on their very first challenge where they can request a challenge against, maximum response time to challenge requests, non-participation penalties, and more. After the basic setup steps have been completed, the director is able to customize the archery ladder website. Select a color template, add a message tot eh website home page, and upload a challenge ladder logo. The participants section enables the director to add new archers to the ladder who don’t enter online, make challenge requests on behalf of other archers, and report results. Different archery ladder divisions can be viewed on the sport ladder divisions page. When results are reported incorrectly, the archery ladder director has the ablity to edit rankings in the ladder software. It is simple for the director to communicate with all the archers who are signed up on the ladder through the built in email system. Activate free archery challenge ladder. View previous Archery tournament and league results.